As well as the Prize itself, the Orwell Youth Prize runs workshops in schools to introduce students not only to Orwell’s writing, but to his principles and values. Workshops are run in pairs to ensure deep and sustained impact and lead by the Delivery Director, Mick Callanan. Teachers can find out more in the information pack. 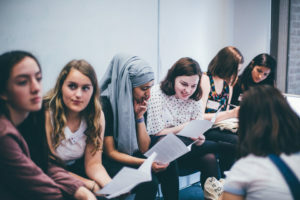 The workshops are centred around discussion, with students encouraged to talk about issues that concern them, and to be confident in their ability to express their views. Each workshop uses an Orwell text as a starting point for a discussion, which can then develop into a way for students to think about how to approach their own writing. Generous support from Penguin means we can provide every student who participates with a copy of a selection of essays by George Orwell. Since 2014 we have run more than fifty workshops in schools all over the country and engaged with young writers on more than 1,000 occasions, whether through our workshops, individual feedback or Celebration Day. In addition, we take a guest writer into every school, often an Orwell Prize nominee – an author or journalist who can share skills and experience with young people, and participates fully in the workshop. The workshops are cross-disciplinary: whilst they are focused on writing, students discuss current affairs, politics, history and ethics during the lively sessions. Many workshops bring together students from different schools, allowing students to discuss their ideas with peers from outside their usual school groups.